WEARING: Bite Beauty Agave Lip Mask and Lip Pencil in 76, a deep orange-red. Embroidered shirt by Free People, patchwork jeans by Thakoon, GIRLS necklace by Lisbeth, watch by Larsson & Jennings. Hello and welcome back! I've been sick with the flu for what feels like ages now and I'm finally getting better. After five consecutive days bed-ridden days, I told myself that enough was enough and I had to start at least acting like I was better so I could fool my body into thinking healthy thoughts again. I'm not exactly sure it works that way but they say "mind over matter" so why not give it a try. I'm sure we can all agree that being sick is the pits but being sick when it's beautiful and sunny out is torture. On top of a fever I was battling an extremely runny nose and dry lips but let me just tell you that my savior, aside from the obvious Tylenol Extra Strength and NyQuil, were these little tubes of Bite Beauty's Agave Lip Mask. I had tubes stashed in pretty much every room of my house. I felt like a Sponge Bob character where at any moment my lips could turn into this gross crusty mess because I was so dehydrated. I also felt border OCD because every my lip mask would wear off, I'd reapply a new layer. Yes, but I still had some unwanted dry bits which is where the Agave Lip Scrub came in handy. Aside from being there for me when I get sick, I use the Agave Lip Mask every night before bed as part of my regular skincare routine. I also ALWAYS have a tube with me when I travel. Flying is so harsh on the skin and lips so it just makes sense. 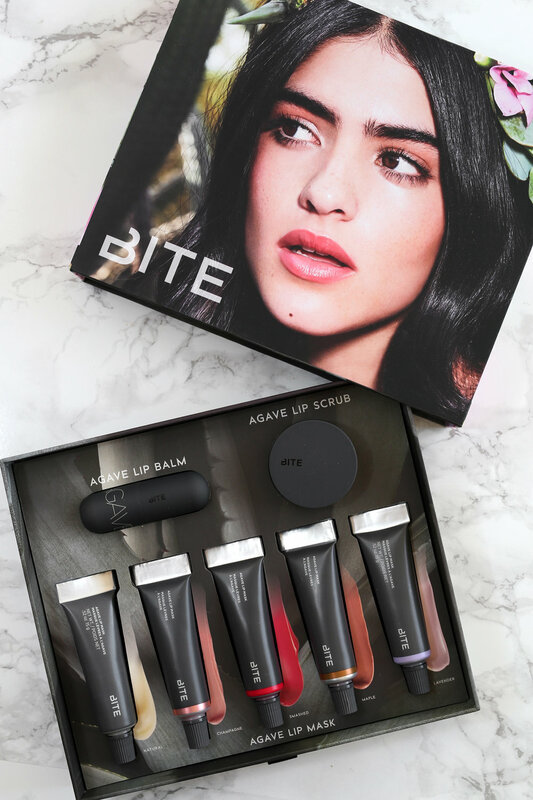 If you don't want to touch your fingers to your mouth when you're traveling, Bite gives us a solid version of their lip mask in a tube. Hygiene and convenience. Bite, you guys think of everything. Nourishes, hydrates, and protects, this lip balm feels like a harder, waxier version of the Lip Mask is excellent for travel! Exfoliate those dry bits away with this enzymatic scrub that includes brown sugar and pineapple enzymes to leave lips feeling soft and smooth. Disclaimer: Lip products in this story are PR samples. All photos and opinions are my own.